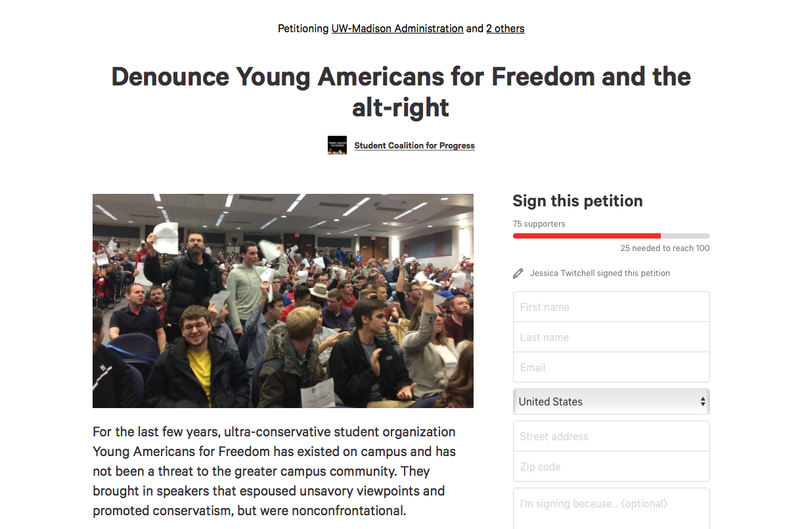 Young Americans for Freedom at the University of Wisconsin (UW YAF) is the target of a bizarre new petition drafted by disgruntled leftists who are asking the university to revoke the club’s charter. It should go without saying that this is completely ridiculous. “We will not be silenced or intimidated by a silly petition,” Bell continued. Ben Shapiro is widely-regarded to be one of the most important and substantive conservative commentators in the media. His lecture was repeatedly disrupted by leftist protestors who shouted over him, banged on walls outside of the event, and chanted expletives in front of children. This is exactly what happens when conservative students simply attempt to express their views on college campuses. Intolerant leftists feel compelled to silence them. Hilariously, the petition is seeking only 100 signatures, while the University of Wisconsin’s total enrollment is over 40,000 students.